After the listing contract has been signed, the listing process is quite involved. Measurements must be taken, disclosures must be filled out, and every possible detail about the property to be sold must be verified and compiled. In order to make sure that they can do this process quickly and correctly, real estate agents use a Listing Checklist that walks them through every step, from taking the measurements of a single room to uploading the property onto the MLS database. Because they are responsible for the accuracy of the listing profile, real estate agents must verify everything from security systems to utility cost, to heated square feet. Careful measurement, calculation and research is all part of this comprehensive process. If the listing profile has errors, there is a greater chance that the right people will not see the house and offers will be prevented from going through. In addition to managing the information that they have just acquired, the agent must also obtain various documents to upload to the listing or save in the property file that they will hand over to the new owners at closing. This is a lot of important information that must be kept as organized and close to hand as possible. Otherwise, finally listing the profile will be twice as complicated. After all the information has been compiled, checked, and double checked, the listing can actually take place. This means that the listing profile is created, proofread, and finally uploaded to the MLS database as well as internal databases that the brokerage keeps. Only after this is done, is the house is finally on the market and ready to be sold. In addition to these three types of listing activities, there are various other logistics that the sellers agents must manage and coordinate, often with other people. Without these practical considerations, necessary processes like buyer walk-throughs would not be possible. 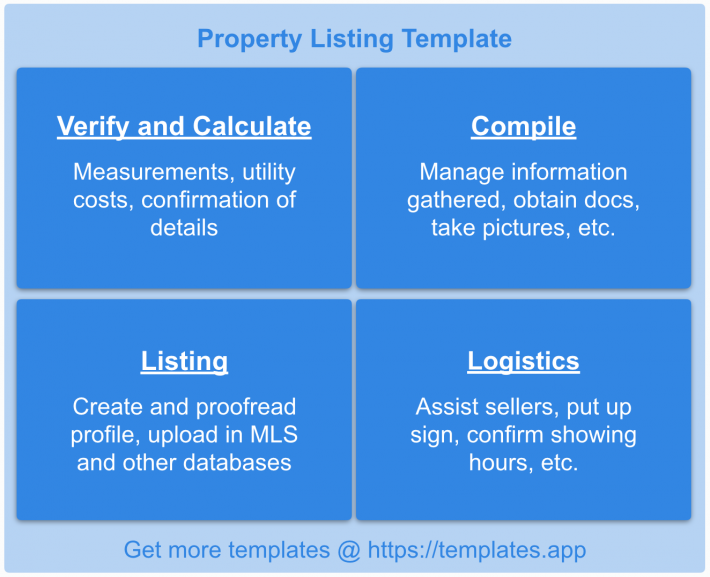 This listing process template holds and visually separates all listing activities in the four categories above, allowing the agent to focus on the right things first, while keeping an eye on everything as needed. This framework supports that process and prevents small details from slipping through the cracks.